Even if Expedia and Google are relevant competitive risks to watch, online travel leader Priceline is positioned to continue going places in the years ahead. Because of its leadership position in the online travel business, Priceline (NASDAQ:BKNG) is clearly firing on all cylinders. Expedia (NASDAQ:EXPE) is a relevant challenger to watch, and investors may want to keep an eye on Google (NASDAQ:GOOG) (NASDAQ:GOOGL) in case the online search giant decides to increase its presence in the industry. However, Priceline has enough strength to continue delivering solid performance for investors while keeping competitors at bay. Consumers from all over the world are increasingly going online to buy all kinds of products and services, and the travel industry is no exception. Travelers appreciate the comfort and convenient prices offered by online travel agencies, and operators in the industry benefit from having access to a wide network of potential clients in a simple and cost-effective way. Companies such as hotels and airlines usually utilize online travel agencies to offer deep discounts on rooms or flights under special conditions. This allows these companies to clear inventory without tarnishing the brand, and customers benefit from pricing discounts, which can often be truly impressive. Besides, Priceline is mostly focused on the agency business model, which means allowing hotels and other service providers to list their own offers, paying the company a commission for every transaction. As opposed to the merchant model, which is based on buying blocks of rooms and selling them at a markup to travelers, the agency model has almost no associated cost of revenue, and this allows Priceline to generate spectacular profit margins -- above 30% of sales at the operating level. 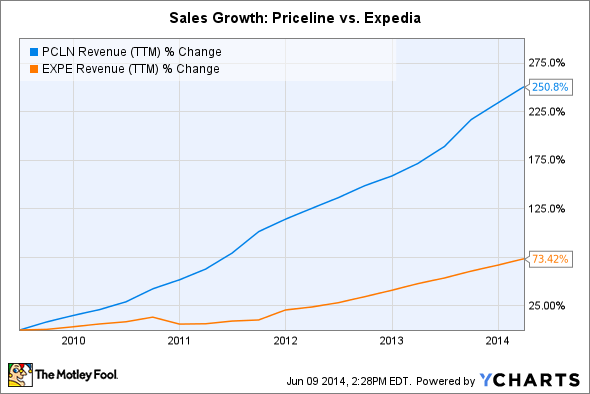 Priceline's biggest competitor is Expedia, which has a considerable presence in the U.S. However, Priceline's focus on international markets has turned out to be a winning strategy over the years, and Priceline has materially outgrown Expedia over the last several years. According to management, Priceline continues gaining market share versus Expedia as of the last quarter, not only in global markets but also in North America. Recent financial reports are validating this: Priceline reported a 26% increase in revenues during the first quarter of 2014 to $1.64 billion, while Expedia announced a smaller sales increase of 19% during the period, reaching $1.2 billion in the quarter. Google has become a reason for concern among analysts following Priceline lately, as the online search giant has signed a licensing deal with hotel booking software company Room 77, and Google has also been adding more photos and reviews to its hotel listings in recent months. Google's ubiquitous online presence and unparalleled financial resources make it a relevant competitor to watch in the business. However, both Priceline and Expedia spend huge amounts of money on Google advertising, so the online search giant may want to be careful not to hurt its relationship with two major clients. According to estimates by RBC Capital Markets, Priceline will spend nearly $1.5 billion in Google advertising during 2014, while Expedia is expected to invest an extra $1 billion. Based on these estimates, Priceline and Expedia together would account for approximately 5% of Google's total advertising revenues. Google has traditionally prioritized advertising over other sources of potential business opportunities over the years, and there is no reason to believe the company is going to choose a different strategy in online travel. Management has proven its ability to translate Priceline's opportunities into spectacular returns for investors; the company has delivered outstanding financial performance, with sales growing by 29.2% annually through the last five years, while earnings per share increased at an even stronger 57.4% annually over that period. Priceline continues producing impressive figures for a company of its size as of the last quarter. Sales during the quarter ended on March 31 grew 26%, to $1.64 billion, while gross travel bookings -- the dollar value of travel services purchased on the platform -- came in at $12.35 billion, a big increase of 34% versus the prior year. Expanding profit margins allowed Priceline to increase earnings at a faster rate than sales, so adjusted earnings per share grew 36% year over year to $7.81 per share, comfortably above analysts' estimates of $6.93 per share for the period. Priceline is not only a market leader in a remarkably attractive business; the company is also rewarding shareholders with rapidly growing sales and sky-high profitability. Priceline benefits from a high-quality business model in the exciting online travel business, the company has enough strength to protect the business from the competition, and financial performance is nothing short of impressive. Those are three powerful reasons the online travel leader is poised to continue gaining altitude in the years ahead.